Khorbi Ghosh: I love your character on 24, you’re such a great addition. I think everybody feels the same way. It was fun today to hear Kiefer say that you turn him on when you’re doing your fight scenes. Annie Wersching: I know! *laughs* Little did I know. Khorbi Ghosh: Did you feel that way too about Jack Bauer? Annie Wersching: I’m a huge fan of the show, I’ve seen every episode, so even just the fact that I was having scenes with Jack Bauer… I got used to it eventually but yeah, it was a bit exciting. Khorbi Ghosh: Yeah, yeah. It was a nice little turn in yesterdays episode or Mondays episode, to see maybe you learned a little bit from Jack. You’re stretching the rules a little bit, bending the rules. Annie Wersching: Yep, yeah. Against my better judgment. I’m definitely conflicted about it. But I’m so horrified by the fact that he betrayed me after I vouched for him and stuck up for him to Larry, that I have to find him. And that was the way I had to do it. Khorbi Ghosh: Will we see more of her going down that slippery slope perhaps? Annie Wersching: It’s definitely her struggle for the season. And his as well, they have a lot of dialogue about it. [Renee] definitely looked to him and talked to him. We have a lot of conversation about it, which is very very interesting for this show, to actually talk about it. Khorbi Ghosh: Right, right. They were talking about that today. How long will it be before the two of you hook back up again, you’re in the same scenes again together? Annie Wersching: The next episode. Khorbi Ghosh: Will it take long for her to forgive him and get his trust? For her to get her trust back? Annie Wersching: Well.. It takes a little bit. It takes a little bit. Khorbi Ghosh: Can you tell me, is this something you see doing next year, the year after? 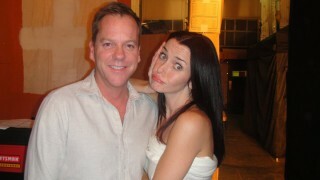 I know on 24 you never know, but..
Annie Wersching: Yeah, you know, it’s 24 so who knows? I would be honored to continue on the show. But then again we don’t know how it ends this season. I mean, I do, but *laughs*. Khorbi Ghosh: Can you give me any little tidbit? Any little clue, teaser? Khorbi Ghosh: Who you might be involved with, who’s gonna come into your world? Annie Wersching: Let’s see… It’s a lot of Jack! *laughs* There definitely becomes a very interesting triangle between Larry (Agent Moss, Jeffrey Nordling’s character) and Jack and me, the three of us. Scenes where the three of us are out standing in front of the Capitol Building having a big scene where we’re arguing. Just really really great scenes and character. Khorbi Ghosh: Ooh a history. Annie Wersching: There’s a history. Khorbi Ghosh: We gonna learn a little more about that? Or..
Annie Wersching: Eventually. They kinda keep that under wraps a little bit. But yes, eventually it’s addressed. Khorbi Ghosh: Awesome. I look forward to seeing it! Thank you. Annie Wersching: Yay, thank you so much!